Using our exclusive state-specific poster checklists, you can be assured that we have every posting requirement for your locations covered. CPC’s free compliance checklists provide the most up-to-date list of all state, federal, and occupational safety notices contained on each state All-On-One™ Poster, as well as additional mandatory and recommended posters for specific industries or city/county locations. 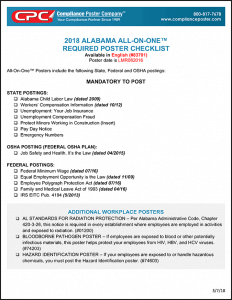 The publication date for each notice and the All-On-One Poster date is included on each checklist so you can be sure you have the current version. If your poster or one of its mandatory notices seem to be out of date, don’t panic! A new poster is not always required. You may have remained in compliance with a major posting change using CPC’s signature Peel ‘N Post update stickers, or the intervening changes to postings, if any, were minor and did not require a full poster update. Of course, if you have questions about listed postings or additional requirements for your company, or if you need an urgent poster update, you can contact one of our compliance advisors to discuss your needs in detail. Click on the name of your state/province/territory listed below to download and print our free state checklists.